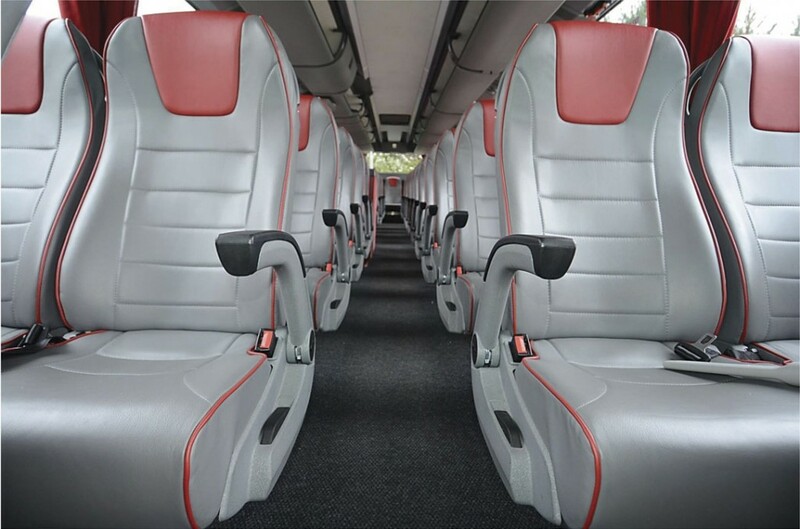 The widespread adoption of E-Leather for bus interiors is helping to enhance the bus journey experience for customers and increasing the appeal of the bus to people currently relying on other transport modes. It is well established with new orders being won all of the time. By the end of April there will be 3,000 buses fitted with the product running in the UK. Perhaps surprisingly, it is in the coach sector that the benefits have been slower to win over customers from moquette and traditional leather. There have been exceptions which have shown what can be achieved. 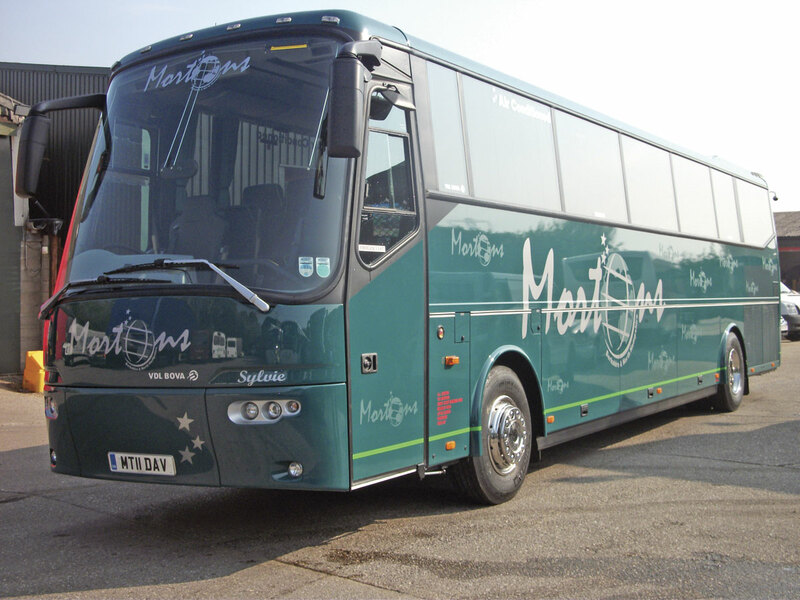 Mortons Coaches specified E-Leather in two VDL Futuras and Swindon based Barnes Travel selected it for another Futura Classic, while Chalfont Coaches opted for it in two Van Hools, all supplied through Moseley in the South. 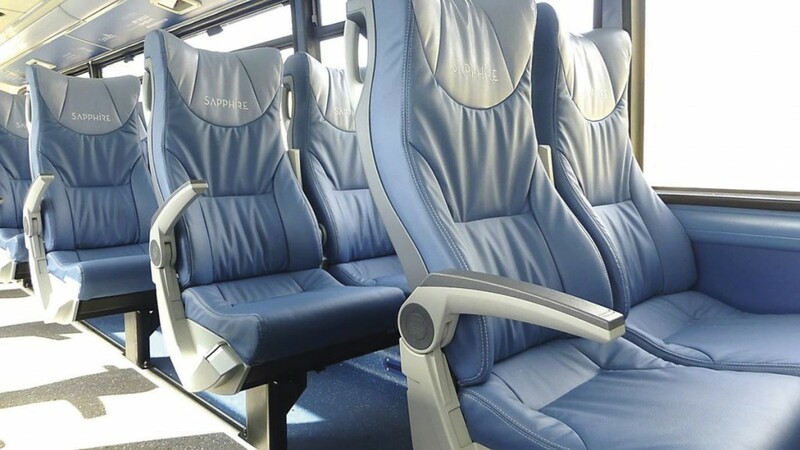 Arriva also chose it for 2+1 Esteban Egge coach seats on the top deck of the vehicles for its Rhyl to Llandudno route. 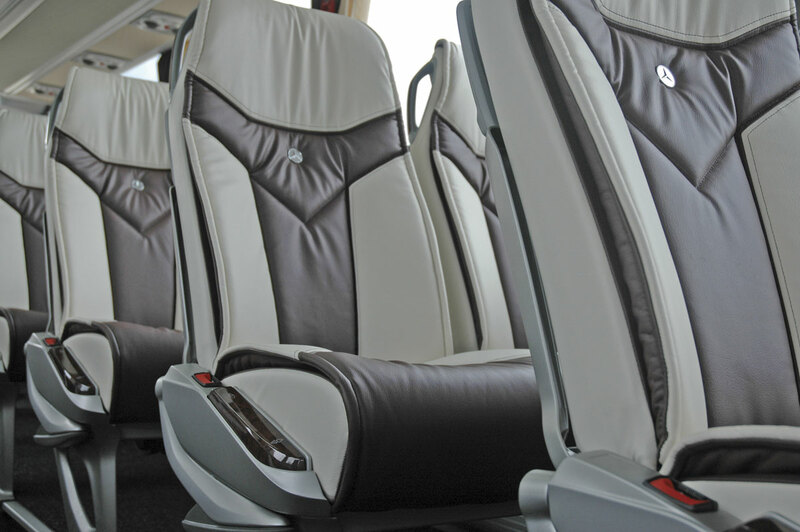 Now, after extensive audits of the company and its processes, Mercedes-Benz in the UK and Ireland is offering coaches with seats trimmed in E-Leather. The recent batch of ten Tourismos delivered to Dublin Coach were fully upholstered in two tone cream and brown E-Leather but there are a variety of other options. The Tourismo TSE seat in the Tourismo can now have E-Leather headrests and there is also full E-Leather alternative available. A complete colour match of the product with 30 Mercedes-Benz colours has been undertaken. There is also carry over to the bus side. Ten Citaros being supplied next year to Blackpool Transport are E-Leather trimmed. Sales Manager, Carl Watkins, believes that the longer the experience operators have of E-Leather, the greater their appreciation of its performance. Apart from the initial benefit of costs on a par with traditional moquette, he believes that the key benefit is in the way that it retains its appearance. It had already proved itself in use on aircraft but in many ways a bus is a more hostile environment and yet the colour retention and resistance to scuffing compared to traditional leather is being reliably delivered. Additional advantages are that E-Leather retains its shape and does not go stretchy and ‘puddle’ after prolonged use, and it also reacts well in hotter environments such as on back seats near to engine bays, where it has a much reduced propensity for cracking and other degradation. There have been criticisms of some leathers for becoming shinier with wear; E-Leather dulls off making instances of passengers sliding off seats less likely. With the probability of increases in permitted axle loadings in the not too distant future the weight advantages, typically one kg per seat on a coach, will be less important though still not to be ignored given the correlation between weight and fuel consumption. Carl explained that most moquette weighs 900gm per square metre whereas E-Leather is 560gm per square metre. A typical saving on a double deck bus, which would usually use less material, is around 35kg. In the past, fears of vandalism left operators reluctant to specify leather or E-Leather for vehicles that were likely to be carrying school children at some stage in their duty cycles. Carl told me that research in Northern Ireland suggests that bus and coach seat vandalism has dropped dramatically in recent years, not because of any vandal resistant properties of the trim material but because children are now so busy on social media that they are not reaching the boredom threshold that often triggered anti social behaviour. It has been a busy year on the exhibition front with the team attending international shows, some of which have a much broader visitor base. Innotrans in Germany, railway interior exhibitions in Cologne and Prague and Busworld in Kortrijk are among events at which the company either has been or will be represented. Attending Euro Bus Expo at the NEC proved worthwhile with major orders signed with some of the country’s major bus operators. Visitors to the large stand were able to not only look at samples of different E-Leathers, but also learn more about how it is produced and see examples of seats trimmed in it. Among the latter was a seat produced by Politecnica using a multi needle sowing machine in which they have just made a six-figure investment. This enables them to create complicated geometric patterns in colours contrasting with the E-Leather material. 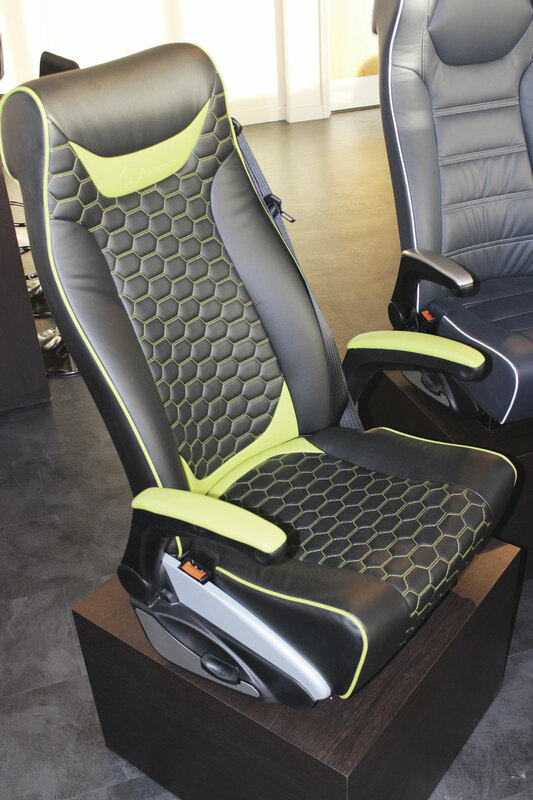 On the display seat, black E-Leather was used in conjunction with lime green thread in a honeycomb pattern set off by similarly coloured piping and insets. Another exhibit that created considerable show interest was the TC9 coach debuting on Yutong’s stand. Offered by Pelican Engineering, the TC9 shown was in the colours of Air Lynx who decided two weeks before the show that they would like to opt for leather trim. E-Leather Sales Manager, Carl Watkins, pulled out all the stops and arranged for Eastgate Coach Trimmers to retrim the vehicle in time to appear in Birmingham where it created a lot of favourable comment. As well as the Air Lynx coach, a further example has been ordered with E-Leather trim by Welsh of Pontefract who has opted for an attractive combination of cream with red piping. Apart from the previously mentioned Blackpool deal, recent bus orders include 29 Streetlites for Go North East, Optares for new Adventure Travel with two-tone blue E-leather trimmed Esteban seats, Wrightbus Streetlites for First and a repeat order from Arriva for 130 ADL Enviro400s for standard, Max and Sapphire duties. Nottingham City Transport, which last year took 70 Enviro200 and 400 buses is combining E-Leather and a flat weave material on its next Enviro400s. First is using it for refurbishments of buses in Southampton and Chelmsford.